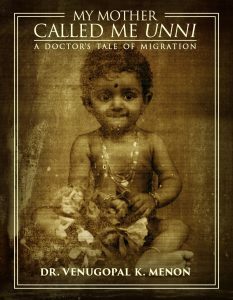 The author Venugopal Menon was born as the eldest of seven children into a conventional Hindu family in the pre-independent, colonial India. He was raised with time-tested cultural traditions during the lean economic times of WWII, getting his first pair of footwear in the sixth grade and electricity coming to his house when he was in High School. As a nine-year-old, he witnessed India gaining independence from the British. After graduation, he volunteered and served the Indian army during the Chinese invasion. With responsibility to support his parents and younger siblings, but being ambitious to gain higher education, he left India, spent a year in Scotland before arriving in the United States. He completed his training in Pediatrics, Allergy, Asthma & Immunology, getting certification and fellowships in both. He was also invited by the prestigious Royal Society of Medicine, London and was conferred a Fellowship. He worked as an associate owner of the prestigious McGovern Allergy Clinic in Houston for thirty-five years, serving as its President for eight, before retiring. During the early eighties, he briefly went to India, establishing a department in the Apollo Hospital in Chennai. He is married to Sreedevi for 54 years and the couple have two daughters and a son, who all are married and settled in the USA. They have six grandchildren. Venugopal Menon, being a pioneer Indian settler of the community, has been involved in establishing many professional, civic, religious, charitable, and social organizations and served as the chairman and president of a few. He cultivated a variety of interests such as reading, writing, travel, photography, and being involved in social causes. After retiring, he wrote his memoirs as requested and encouraged by his children who felt the need for such a treatise, being a source to establish a base and trace the roots of the family between continents and cultures. He and his wife live in Pearland, in a Kerala-style home that they built adjacent to Sri Meenakshi Temple, of which he is a founder and past Chairman.